This tech-tip is meant to give an understanding of how to edit and configure user contact preferences for notifications from the iMonnit® system. Contact preferences let the system know how you prefer to be contacted for different types of notifications, for example, sensor alerts and subscription alerts. To start, you will need to be logged into the iMonnit® online software at www.imonnit.com. To access user information, find the "User List" option under the account navigation menu located under the symbol in the top right corner. You will see a page off all users on your account. To edit the contact preferences for a user, simply select their name. To edit contact preferences, click on the "Notification Details" tab. There are three different contact methods available to iMonnit users; Email, SMS Text and Voice Calls. The first section allows you to manage the contact email address as well as manage whether the email address has opted in or out of receiving additional notices from the iMonnit system, such as scheduled maintenance and other valuable information. The next section is for SMS text message settings. Monnit® provides two different text messaging services for notifications. 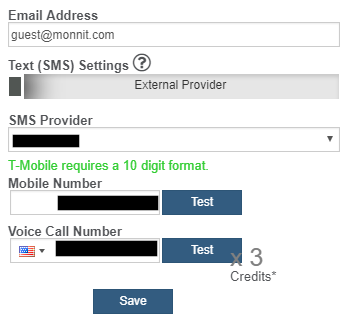 The first("External Provider") is provided without cost from Monnit, using cellular carrier email to text services. (Note: not all cellular carriers provide this service, so if your carrier is not listed in the drop down box, you will need to use the "Direct Delivery" method. Also, some carriers may charge for text messages received through their email to text service, you may want to contact your provider to verify). The "Direct Delivery" option sends SMS text messages through a direct SMS text service on Monnit's behalf. This service is more reliable and typically provides faster delivery than the other option. Direct delivery SMS messages use notification credits which can be purchased in 100 credit bundles though your portal or the iMonnit web store. The next section is for setting up Voice Call notifications. Voice call notifications provide audible alerts via standard phone call methods. Voice call notifications use notification credits which can be purchased in 100 credit bundles though your portal or the iMonnit web store. To learn more about using voice call notifications view this support article. When you have finished making changes, make sure you click the "Save" button at the bottom of the page to save the settings.